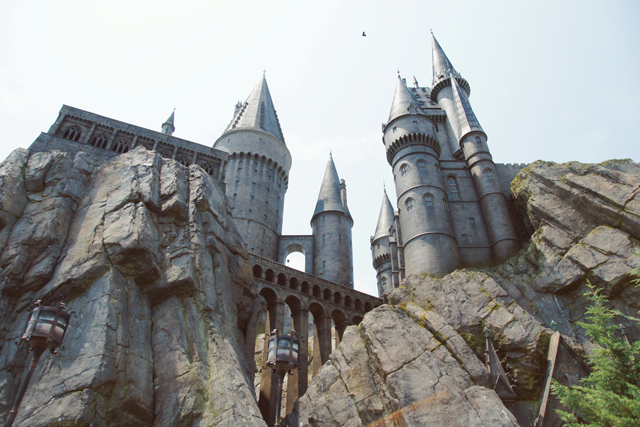 Wayfaring Wanderer: The Wizarding World of Harry Potter @ Islands of Adventure | Universal Studios | Orlando, FL. 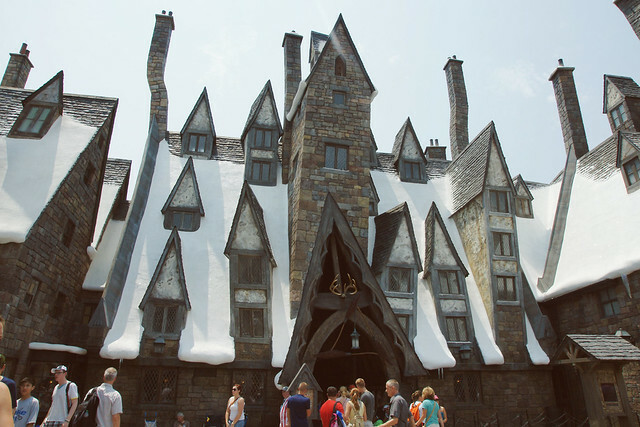 The Wizarding World of Harry Potter @ Islands of Adventure | Universal Studios | Orlando, FL. I'm still surprised when I hear from some people that they haven't seen any of the Harry Potter movies. The books, I understand, not everyone enjoys reading. If you've read all of the books and refuse to watch any of the movies, well, that's just plain weird. Then again, maybe I'm the weird one because I rather enjoy reading about wizards that have magical powers. In any event, I think the Harry Potter stories are fabulous. The amount of imagination it took for J.K. Rowling to conjure such a fantastical and mystical world is beyond my comprehension. What I do know, though, is that the Harry Potter stories have captivated me since the beginning. I've only read up to the 5th installment of the HP series. However, I have seen all of the films (most more than once), including the most recent movie that brought the epic adventure to a bittersweet end. 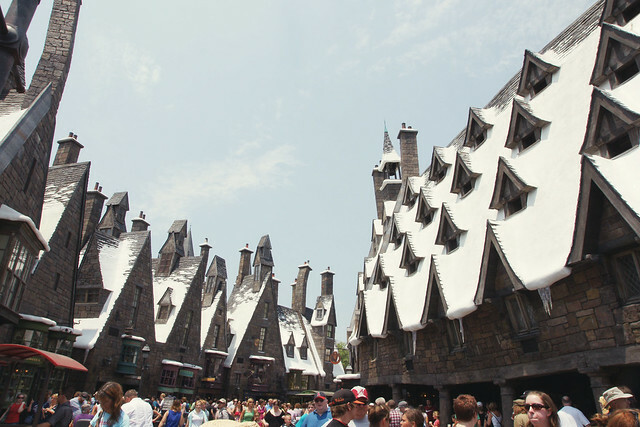 It was pretty sad to realize that we would see no more movies or read any other books, but it is comforting to know that the Wizarding World of Harry Potter at Islands of Adventure is there to satiate any feelings of loss we might encounter. From the moment I heard about the Universal theme park opening up this new area, it became my mission to get there. 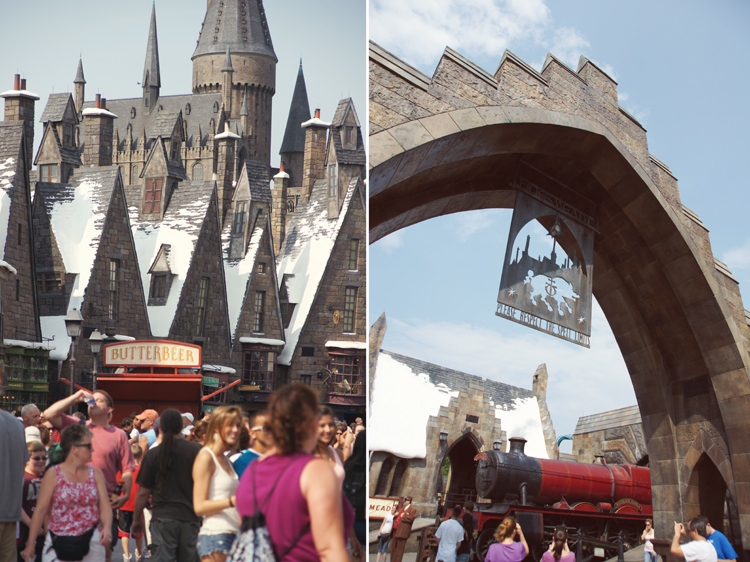 Instead of having to imagine walking through Hogsmeade and the Hogwarts castle, we would have an opportunity to see it in real-life. Okay, so it's not the real deal, but Universal Studios did an incredible job of recreating this imaginary world. I was completely enamored by the surroundings as soon as I stepped through the towering gate. The buildings stood tall and were all made of stone. Capturing images of the structures was quite difficult due to the amount of tourists lining the streets. It was impossible to get photos without a hundred heads popping into the frame. One thing that I found particularly odd about the buildings was that they chose to adorn the rooftops with snow. In the summertime it just didn't seem to make much sense. However, I can see that being something special they could do in the wintertime. We stopped in a few of the stores that didn't have lines overflowing out the door. Zonko's Joke Shop & Honeydukes were the only ones we managed to peruse. I made a decision not to buy anything from the candy shop at the time, but I'm kicking myself now for not getting a chocolate toad or flavored beans. 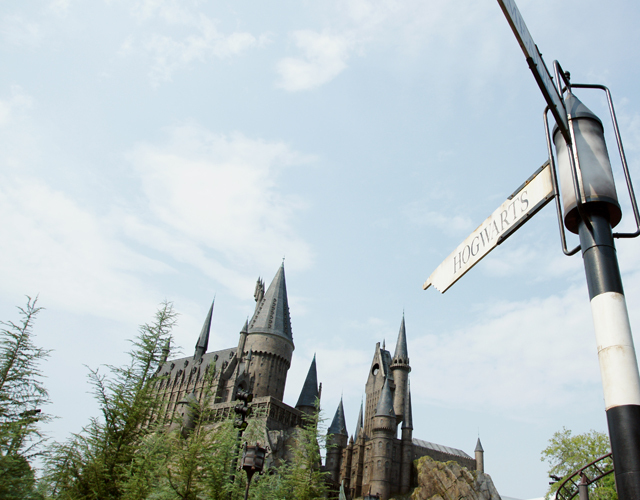 After making our way through the streets of Hogsmeade, we headed toward the Hogwarts castle to take a ride on Harry Potter and the Forbidden Journey. After waiting outside in a long and windy line, we actually got to go inside the castle. My camera was in the locker, so I didn't get any pictures of the inside, but it was wicked awesome. The ride itself was equally awesome. Read more about them in a previous post: My Favorite Islands of Adventure Theme Park Rides. 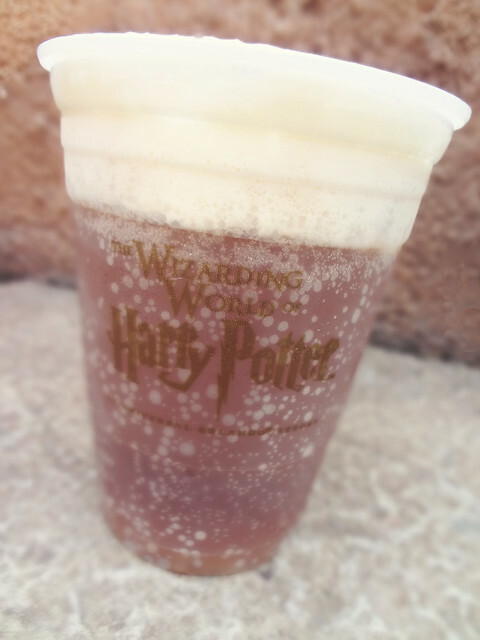 Once we rode a couple rides in the Wizarding World of Harry Potter, and visited a couple of the shops, the only thing left for me to do was grab a cup of butterbeer! I patiently waited in a 15 minute line so I could get a taste. It was well worth the wait, too, because I loved it. The flavor reminded me of cream soda, and the foamy froth on top was sweet. I'd love to have another one right now! The only downside to the WW of HP was the large amount of people. Other than that, the whole place was amazing, especially for someone who's enthralled by the Harry Potter stories. I'm dying to go back already! Have you followed the Harry Potter books or movies? your photography is amazing! You take photos in the moment and they looks so fresh and real and untampered with.